On Thanksgiving Day of 1986, I was walking through a cemetery by my grandparents’ home when I saw a cross in the center of the field. Jesus was hanging on the cross, and as I stared at this portrayal of Him, tears flowed and questions formed. “Why is the Christian walk like this?” I was planning to take my life the following Monday, at 19 years old. I had prayed a simple salvation prayer a year earlier, but was persecuted by friends and family then overcome by depression. I had sought truth, and failed. As I sat at His feet, something within me cried out in despair for God to save me, and all I could do was weep uncontrollably: “Lord, if you want me to live, send someone to help me! I want to meet someone who walks the walk and practices what they preach.” After calming down, I heard the Lord speak: “I will answer your prayer. I will need more time.” I knew what He was asking. He wanted me to yield my plan of committing suicide over to Him. I agreed to wait until after Christmas. At church that Sunday I saw an announcement in the bulletin for a drama team performance Doug Stringer was hosting at a sister church on December 10. I had heard of Doug on the radio and at my youth group. The Lord immediately impressed on me to attend that service. It was 10 days away, and those 10 days of waiting seemed like a nightmare. But when the day finally arrived, I declared to the Lord, If this is not the answer, I’m not waiting anymore. The service included the most unexpected portrayal of the Lord ever displayed. A complete layout of the life of Christ and the battle for my soul was presented, and for the first time I understood what I was up against. Christianity had an enemy who would do everything in his power to destroy; I was almost another victim of his game. God grabbed hold of my heart and did not let go. Doug noticed the encounter and called me up on stage with him to reinforce the experience. I walked away with a new birth, a regenerated soul, and a fresh vision for my life. Everyone I encountered after that saw the change—my family, my youth group, my friends. I was willing to accept the challenge to live life to the fullest. God held me to those words as life moved on. But when I entered my first serious relationship, I walked out on Turning Point. Within a few months, I encountered verbal and physical abuse that left me wounded inside and out. Three years to the day, on December 10, 1989, my soul cried out for my life once again. But this time God said: “Do you remember the prayer you prayed in 1986 for your life? What was My answer?” I knew I was guilty of walking away from the very ministry where God planted me to save my life in the first place. Turning Point represented a vow I made to be faithful to His calling, and it represented an exchange: my life for His. tests more than I can count. But Doug remained faithful. He was always there to come back to, and he was always reaching out to help those in need. In 2004, I returned once more to complete a life-time of training, sitting under his ministry and learning the deep secrets of keeping the faith and allowing the Holy Spirit to use me and direct me as He sees fit. 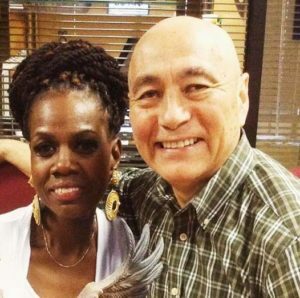 At Doug’s “Leadership Awakening” conference in March of 2013, the seed of promotion to leadership was placed. By December, I was promoted to Children’s Church Director for Fellowship at Well of Life. In March of 2015, I was promoted again to Deacon and my husband to Elder. We participate and serve for our church outreach called “Freedom and Healing Seminars,” where a deep teaching is offered to those desiring a closer relationship with the Lord. daughter to the King. Doug and Lisa have been a huge inspiration to me and play a big role in my life as leaders. I would not be here today if it wasn’t for one man being obedient to God. I will never forget what Turning Point has done for me. 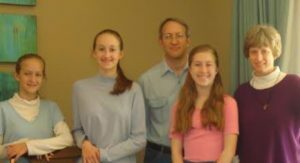 CINDY IS PICTURE ABOVE WITH HUSBAND TOM AND DAUGHTERS BEKAH, HANNAH, AND SARAH. The Lord divinely connected me to TPMI when I was in a wilderness season in my life. One day in 1996, I was watching Daystar when Dr. Doug Stringer came on the screen. He stated that TPMI was hosting 40 days of prayer and fasting at a location referred to as “Prayer Mountain.” I determined to participate and attended 38 of the 40 nights. During that time I became a volunteer at the TPMI ministry. Later I came on staff as the receptionist, then became the Outreach Coordinator. Today I am the Religious Coordinator (Chaplain) at the Lafayette Parish Correctional Center, which includes four different facilities and serves an offender population of 1100. God used TPMI to train me for this present position of Chaplain. I learned the principles of consecration, commitment, and action. I was taught networking and the true meaning of “unity with a purpose.” What I gleaned from Dr. Stringer and others serving with TPMI under God’s grace helped me develop a team of 50 regular volunteers and 35 extras, all coming from local ministries and churches of Lafayette Parish and surrounding areas. While at TPMI I also learned the importance of honoring those who partner with me in ministry. With focused intentionality, I honor those who give their talents and resources in helping bring the Glory of God to our inmates. I also give the Divine Servant Award to ministries and churches for their service. I am continually, deeply grateful to Dr. Stringer and the partners of TPMI. Thanks to God for the many who have poured prayer, words, and encouragement into my life often erupts from my heart. In the words of Dr. Doug Stringer, quoting Proverbs 14:25: “A true witness rescues lives.” That’s my dream. And I feel like I’m living that dream,by God’s grace. Our amazing journey began in the Spring of 1996. Our friend Scott Hastings began showing up at our regular Saturday night N.A. (Narcotics Anonymous) meeting and sharing how this man named Doug Stringer was going down to Montrose (the dark hole of Houston) to share about Jesus with street kids and that miracles were happening. Scott did not give up inviting us, and even shared a paperback New Testament with us. After attending TPMI weekly teachings and participating in several community events over a period of time, we did learn what our calling was. Surprisingly, it involved motorcycles. We found that our love for motorcycles and the Lord were actually a good combination. We were enjoying our comfort zone of a small ministry and serving with Montrose Street Church, which we came to be a part of through TPMI. We started riding to the weekly outreach, and the young people were drawn to the bikes; in turn we were able to build relationships and trust with several of the “street kids.” This was really cool and it continued for over four years. If you’ve known Doug for any length of time, you know that if you share an idea for ministry, he believes you need to follow through with it. It did not happen right away, but as we grew deeper into the biker community, the Jericho Ride began to evolve. 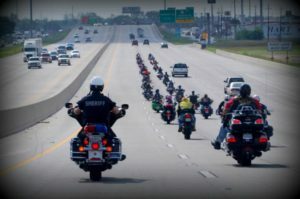 The first Jericho Ride was in 2009 with about 12 riders circling the City of Houston on the 610 freeway, praying over the city. 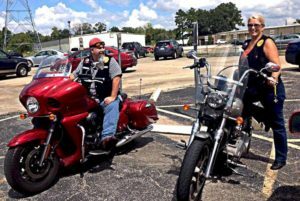 Jericho Ride II grew to eight cities in Texas, with about 25 riders in Houston. The following year, we invited cities from all over the U.S. and abroad, with 24 cities in the U.S. responding. It was so exciting for us to see this growth, but it did not stop there! By 2013, Jericho V consisted of 103 cities around the world: 98 in the US, two in Canada, two in Scotland, and one in Ireland. In 2014, we had 96 cities. In 2015, the numbers began shrinking and John thought Jericho VII might be the final ride. But God’s plans are not our plans. Although there were only 66 U.S. cities committed to ride, John received an email a couple months before the ride date from a man in South Africa who indicated there were a few interested cities there. It turned out there were eight cities with approximately 500 hundred riders in South Africa! Since we first arrived at TPMI in 1996, so much has happened in our own lives and the lives of family and friends. We were two addicts who met at a NA meeting, fell in love, married through TPMI, and came to a ministry home that loved us, taught us, and encouraged us to keep pressing in. We found our calling and got equipped through TPMI. We are now very immersed in the biker world, riding where most people are not invited or willing to go. God has given us great favor to share His love and word on the highways and the byways. We do hospital visits and attend many functions for fallen bikers, do toy rides for Christmas gifts, and pray for our brother and sister bikers. Nineteen years ago, we never dreamed this is where we would be today. We ride for Jesus every day. Three words still resonate as if it were yesterday: Consecration, Commitment and Action. Nearly 25 years later, those life principles still guide my daily walk with the Lord. When I first walked into a Friday night TPMI Bible study nearly 25 years ago, I sensed God was calling me to a deeper walk with Him. Through study of the Word and outreaches to the inner-city of Houston, my faith grew. It was also during those outreaches that I met a young lady who was participating through her church. Two years later, Delia became my wife. Our involvement with the ministry continued, and I joined the staff. The foundation laid for a network of churches and ministries serving community needs was established in that era. Today we know it as the Somebody Cares network, which is impacting communities nationally and internationally. During my seven-year tenure on staff, I made lifelong friends. My service through TPMI and Somebody Cares set the course for where I am today. During that time, Delia gave birth to three of our beautiful children, Hope, Jacob, and Joshua. 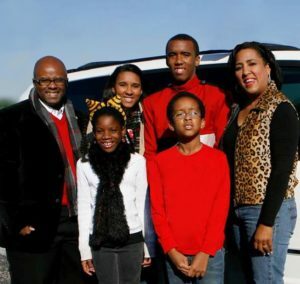 We knew there was more the Lord was asking of us, and we were part of a team at Somebody Cares raising awareness of the thousands of children in the Greater Houston area still in need of adoption. As a result, our fourth child Hollie joined the family. “Victory doesn’t go to those that never fail, but to those that never quit.” I ran again and won! 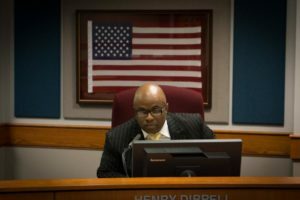 I later won re-election for a second term, serving as vice president of the school board. Katy is home of the fastest growing zip codes in America, and 80% of the people who move there do so because of the school system. Because of our success, Katy ISD influences education around the nation. In addition to serving on the Katy School Board, I own a Katy-based marketing firm called Blue Marble Unlimited. Delia works for a wonderful Christian company in Katy. Because of our time at Turning Point, we imbibed three principles into our hearts, which continue to guide our life-course. CONSECRATION of our lives unto the Lord means we’re set apart for His purposes. ACTION means we will actively share the love and cause of Christ. lives as a family. For that and so much more, I’m forever grateful.